Chef Danilo "DJ" Tangalin, Jr. Chef Danilo "DJ" Tangalin, who recently was tasked with opening Decoy at Lakehouse Hotel & Resort on Lake San Marcos and was the Executive Chef at Tower23's JRDN restaurant in Pacific Beach before that, was let go today by hospitality group Eat.Drink.Sleep, where he has served as the Corporate Executive Chef for more than a year. "The company decided to move on to a different direction without me," commented Chef Tangalin. "I am thankful for the opportunity EDS has given me and my family. I'm looking forward on finding my next home and keep cooking great food to push the San Diego food scene to the next level." 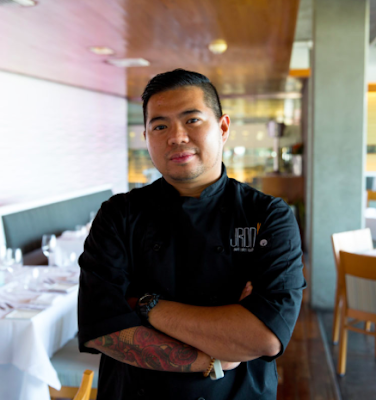 Chef Tangalin was the Executive Chef at Eat.Drink.Sleep's JRDN restaurant at Tower23 Hotel in Pacific Beach from Spring 2015 until he was appointed to oversee the launch of the company's ambitious Decoy restaurant at the newly renovated Lakehouse Hotel & Resort in San Marcos, which only opened this past August 29 and is now without an Executive Chef. Chef Tangalin has spent time in some of the country's most esteemed kitchens including Le Bernardin with Eric Ripert, Volt with Bryan Voltaggio, Cyrus with Douglas Keane and Coi with Daniel Patterson. Settling in San Diego, DJ worked as chef de cuisine at Prepkitchen before joining the team at Eat.Drink.Sleep. as a sous chef at JRDN in 2014. "Danilo 'DJ' Tangalin has departed his role as Corporate Executive Chef at Eat.Drink.Sleep.," commented Stacy Warner, Director of Sales & Marketing for EDS. "We are grateful for Chef DJ's efforts during the past two years and wish him the best." Eat.Drink.Sleep. is a hospitality group that owns numerous hotels and restaurants around Southern California, including local San Diego properties like Tower23 Hotel, Lakehouse Hotel & Resort, Draft, Cannonball, and manages the culinary operations at Belmont Park.